Nivea is my all time favorite brand mainly Nivea Soft Refreshingly Soft Moisturizing Cream. I love to use this in the winter especially as it always keeps my weather beaten skin feeling lovely. This Soft Moisturizing Cream is vary good for me in summer also. Nivea Soft Light Texture Cream comes with Jojoba Oil and Vitamin E which i really love. Apply creme over body, face and hands as needed. Water, Myristyl Alcohol, Mineral Oil, Glycerin, Butylene Glycol, Alcohol Denat., Stearic Acid, Petrolatum, Myristyl Myristate, Glyceryl Stearate, Hydrogenated Coco Glycerides, Dimethicone, Simmondsia Chinensis Seed Oil (Jojoba), Tocopheryl Acetate, Polyglyceryl 2 Caprate, Phenoxyethanol, Lanolin Alcohol, Fragrance, Carbomer, Sodium Hydroxide, Cetyl Phosphate, Methylparaben, Ethylparaben, Propylparaben, Butylparaben, Isobutylparaben. 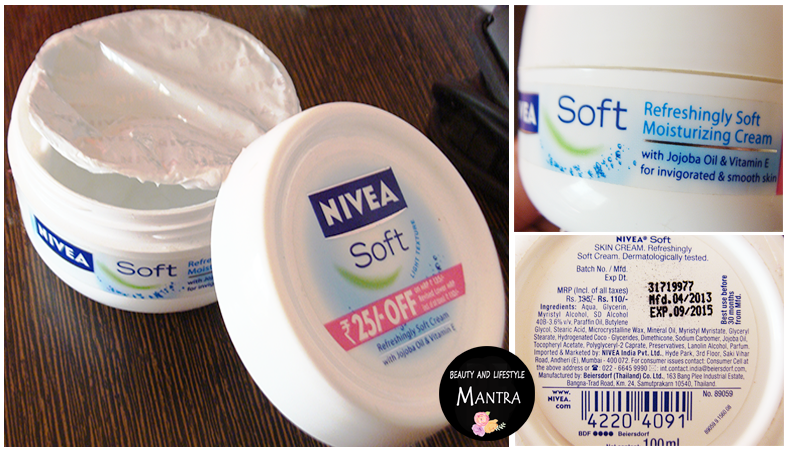 If you are on a lookout for a good moisturizer in your budget, then Nivea refreshingly soft cream will not disappoint you! This moisturizing cream is a good pick for winter and summers also, so I will defiantly repurchase. Over all I love this cream which can be used on face and body too! It is hydrating yet non sticky, smells amazing and is pocket friendly.